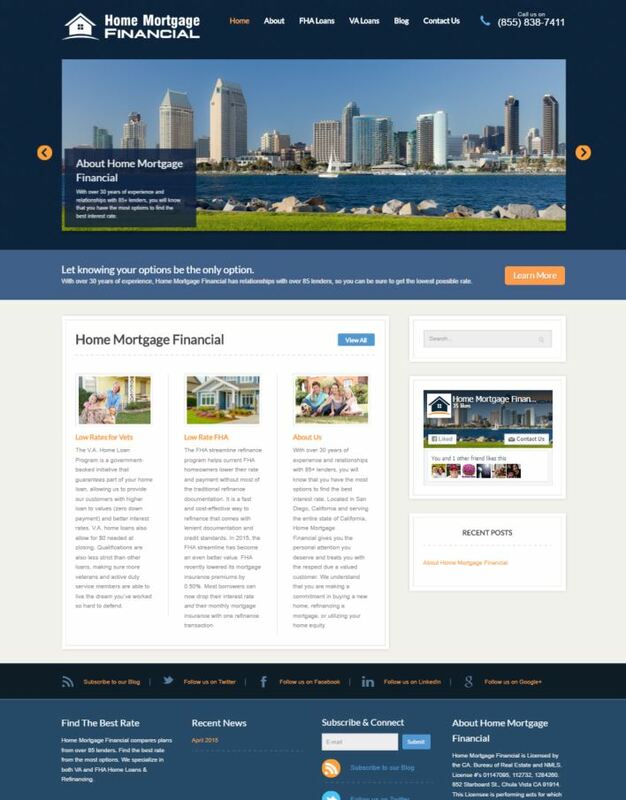 Pyxis Media Group recently completed a Pyxis Driven™ Website & Communication Platform for Home Mortgage Financial. Home Mortgage Financial now not only has a place to showcase everything about their services, but they also are able to easily share news. events and announcements. Their platform allows them to create a news post once, and it’s automatically shared not only on their website, but also with all of the major social media outlets, their eNewsletter, and RSS Feed. Ready to get started? Check out our Pyxis Solution Package options. Pyxis Driven Solution Packages provide you with exact pricing and exact specifications of everything that you will receive when you engage with Pyxis Media Group. Based in San Diego, California – Home Mortgage Financial compares plans from over 85 lenders. Find the best rate from the most options. They specialize in both VA and FHA Home Loans & Refinancing for the entire state of California.